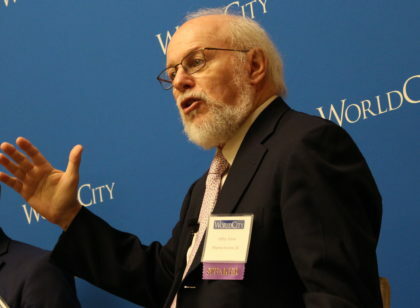 Trade in the Trump Era, U.S. TradeNumbers - WorldCity, Inc.
What has trade policy and trade data looked like so far in the era of President Trump? 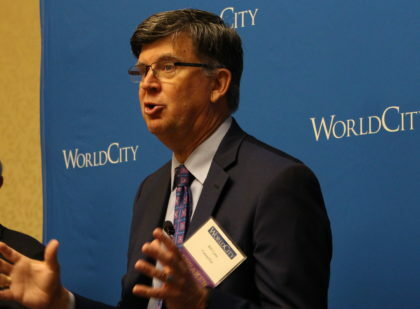 WorldCity’s latest Trade Connections event shared the latest straight from two Washington D.C. experts and an attorney well versed in tax law here in Miami. The event also celebrated the release of U.S. TradeNumbers, which is available for download by clicking here. 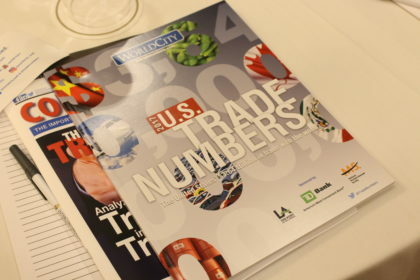 “The publication you are getting today is more valuable now than it’s ever been,” said panelist Bill Lane about U.S. TradeNumbers, which was handed out to the Trade Connections members in attendance. 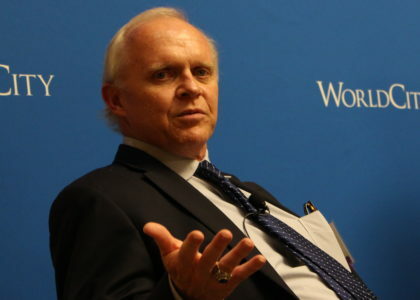 Lane spent more than 40 years at Caterpillar, most recently as Senior Director of Global Government and Corporate Affairs. The findings revealed in U.S. TradeNumbers set up a discussion about how trade has shifted in the Trump administration and where it is headed next. Canada is the top U.S. trade partner, according to Census Bureau data at WorldCity’s ustradenumbers.com. China, which has finished on top on an annual basis the last two years, is ranked second. U.S. exports are up 6.67 percent year-to-date, with imports up 7.24 percent. Exports from the South Florida customs district are up 2.47% YTD, with imports out of South Florida also up 1.98%. Notably cell phones and plasma/vaccines/blood exports from South Florida are up more than 20 percent YTD. Trump’s proposed NAFTA changes will be revealing. Panelist Jeffrey Schott of the Peterson Institute for International Economics in Washington D.C.. Soon there will be another indication on whether the Trump administration will continue to heed warnings. “I think it’s slowly dawning on people who have had no government experience and have never dealt with international relations before that there are these benefits,” said Schott. The test will be when the White House reveals its negotiating objectives for NAFTA in about a month. If they look like what was agreed to in the Trans-Pacific Partnership, that will indicate a relatively smooth agreement on a NAFTA update. President Trump withdrew the United States from the 12-nation Trans-Pacific Partnership in one of his first actions as President. Leave Canada and Mexico alone. Panelist Bill Lane, who spent 40 years at Caterpillar and is now at the Washington International Trade Association. Lane spelled out some powerful numbers on why NAFTA still matters. What does this have to do with the rhetoric on reforming NAFTA? That country is China. China must reduce trade barriers. “What drives Miami’s economy is velocity. The more trade, whether it’s imports or exports, the more this area is going to prosper,” said Lane. “The Florida delegation, the Florida business community has a huge stake in what’s going on right now.” That’s because Florida serves as a logistics and distribution hub. Innovation from government or private sector? Click here to check out our Facebook album from this event, and tag yourself if you were in attendance! That was the question from Salvadore Romo, director of Sthal, as well as what innovations in trade should look like. 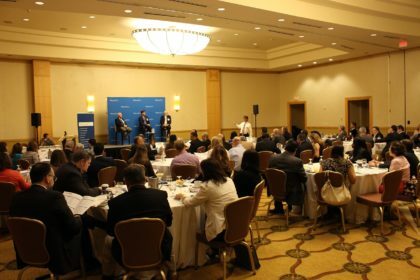 One panelist had a strong opinion on who should not be spearheading innovation. Panelist Jim Spencer, director of international tax services at Berkowitz Pollack Brant in South Florida. “A lot of the Fortune 500 companies, a lot of the (intellectual property) data, resides outside the U.S.,” said Jim Spencer, director of international tax services at Berkowitz Pollack Brant in South Florida. Spencer said the reason for that is tax purposes. A lot of regimes (Luxembourg and the Netherlands are examples) make it attractive to locate IP offshore. This is one area where the U.S. could benefit from changes in corporate tax policy. How do we get there? China spent the early 21st century investing in infrastructure, and many there attribute that to the massive growth it has seen since. It’s harder for the U.S. to build things like high-speed rail up and down the east coast, due to current laws. “Health care reform…improving the skills of the workforce,” Schott cited as examples for how to build a platform for sustained productivity growth in the United States. On June 23, World City’s Global Connections series continues with a discussion on Social Media: The New Power of Video. Be sure to attend the next Trade Connections as well on August 18 with the release of Perishables TradeNumbers.